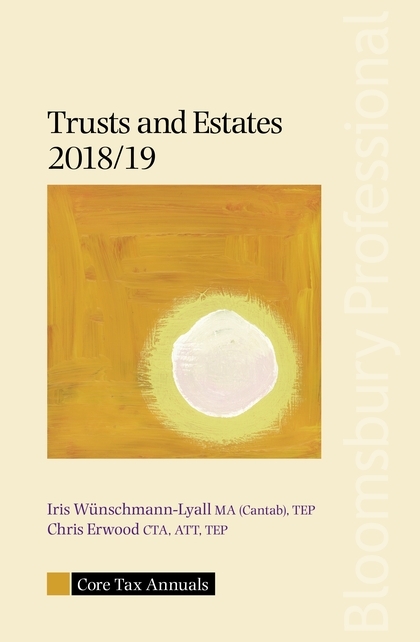 Based on Matthew Hutton’s original popular reference guide, Trusts and Estates is now under the expert authorship of Iris Wünschmann-Lyall and Chris Erwood. It remains as practical and accessible as before whilst providing clear guidance on compliance and operation under current law and is indispensable when starting, running or ending a trust, or dealing with a deceased estate. Bloomsbury Professional Core Tax Annuals include ‘signposts’ at the beginning of each chapter containing a summary of the main points and cross-references to relevant sections of the chapter. These, along with the ‘focus’ sections highlighting the key points in each chapter and examples which are presented in shaded panels for easier reference, makes Trusts and Estates 2018/19 a convenient and accessible resource. Worked examples, tax tables and practical commentaries help to illustrate the latest legislation and the key points of practice. The reader will not only fully understand current tax law, but be comfortable in applying it to their clients’ cases. The technical information and practical know-how detailed in this book will enable the reader to organise their clients’ financial affairs in a tax-efficient and compliant manner.